The idea of ​​convening this meeting certainly did not come out of nowhere. It is the continuation of long-standing joint actions focusing on peace and reunification. In the current conditions that have evolved after the Crans Montana conference, these joint actions must not only continue, but must be intensified and assume an even more mass character. There is no doubt that the big popular mobilizations that have so far been organized in the buffer zone of ​​Ledra Palace aiming at popular intervention and to put pressure on the leaders and the international community so that the procedure of the talks should be productive and yield results, conveyed a powerful message of hope in many directions, given that they have even been cited by the UN Secretary-General himself who has noted this message in the reports he has submitted. KTAMS of Cyprus protested the government’s failure to take no measures to protect the purchasing power of the citizens in the face of the recent price hikes. On the eve of the Second World War (1938-1939), the Mining Industry in Cyprus reached its highest point with significant exports of pyrite and chalcopyrite. The number of workers employed by all the mining companies exceeded 10,000 the majority of whom were landless peasants. Miners’ working conditions and terms of employment were inhuman. The housing and living conditions of workers and their families were in a terrible state. Accidents at work occurred quite often, illnesses plagued workers and protective measures underground, in galleys and buildings were almost non-existent. "AKEL’s position, the dedication towards the solution of our political problem far from serving political and party expediencies and considerations, is driven by genuine patriotism and the concern for the future of our country and people. Within this framework, AKEL will work tirelessly for the resumption of the negotiations as the UN Secretary-General sets out and for their positive outcome. We shall continue to demand the speedy withdrawal of all the occupying troops, the demilitarization of Cyprus and the immediate end of guarantees and intervention rights. At the same time we shall continue to warn about the devastating consequences of any partitionist solution." Cyprus Peace March. 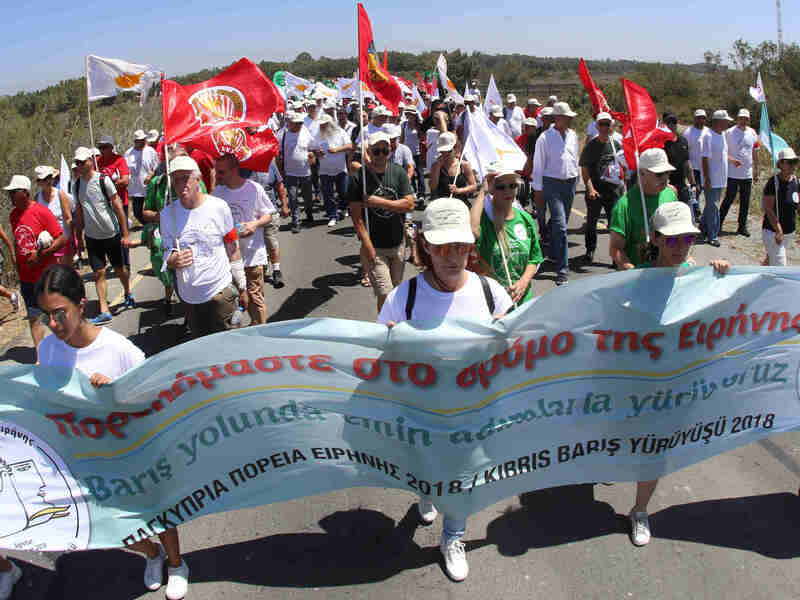 Photo: ICPOn June 10, a Pancyprian Peace March was organized by the Cyprus Peace Council. Thousands of people marched 4.5 kilometers before arriving at the gates of the Akrotiri British Base in Limassol, where they symbolically scattered life jackets and an inflatable boat. In the speeches delivered during the demonstration, the use of Cyprus as a launching pad against neighboring peoples was denounced and demands were expressed for the withdrawal of all foreign troops -especially the army of Turkey occupying almost 40% of Cyprus's territory-, the abolition of the British bases and the dissolution of NATO. A combative demonstration against any kind of facilitation of the new massacre was held by the KKE Party Organizations in Cyprus on Sunday, April 15th, in front of the British base from where in the early hours of Saturday morning the aircrafts that attacked Syrian positions took off. The combative call of the KKE was met with the positive response of many workers during the leaflet distribution that was held on Saturday in workplaces and in the center of Nicosia and of Larnaka, with massive participation. The effort to solve the Cyprus problem isn’t being made without any foundations whatsoever and out of nowhere. There are decisions that form the basis and the framework of the solution, which are expressed with clarity in numerous UN resolutions on Cyprus. The basis for the solution of the Cyprus problem is bi-communal, bi-zonal federation with political equality as defined in the relevant UN resolutions which the Greek Cypriot side has accepted since 1977 and has reaffirmed several times. During their meeting today (February 25th, 2017) held at the central offices of the C.C. of AKEL, AKEL and the United Cyprus Party BKP, discussed the recent negative developments on the Cyprus problem. The two Parties expressed their grave concern about the situation that has evolved, which is harming the effortsfor a successful conclusion of the negotiations and indeed in the final phase in which they are in. It would be a shame were this effort to collapse after so much work has been done and which has resulted in significant convergences being registered on all the chapters without exception of the internal aspect of our political problem. On behalf of the Central Committee of AKEL, I extend a warm militant greeting to all the members and militants of the Youth Organization of EDON, as well as to the youth organizations of the Republican Turkish Party (CTP), the Communal Democracy Party (TDP) and the United Cyprus Party (BKP); to the young people of Cyprus who are again here together in EDON”s mass event; to all of you, Greek Cypriots and Turkish Cypriots, who together take responsibility for your country’s future. AKEL sees in your faces the new generations of the Cypriot Left. We see in you honesty, unselfishness and radicalism. We see in you those young people who will realize and live our dreams for our homeland, but also for the whole world.